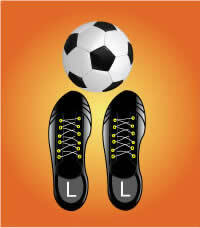 Every soccer player dreams about being able to control the ball equally well with both feet. But let's not imagine anything, since one foot will always be the weaker one; this is no different for professional players, either. There are players who almost achieve two-footedness but there is no such thing as 100% equivalence. Nevertheless, every soccer player should try to make the weak foot stronger by some percentage. A lot then turns out considerably easier: not only can the ball be controlled better, but dribbling becomes much more variable, the shot at the goal becomes more dangerous, and passing is faster and more accurate. How can I improve my poorer foot? It won't surprise anyone that only training, training, and still more training is helpful. Every bit of practice should always intentionally be carried out with both feet, specifically in equal proportions. I once read on an American website, "Whoever uses only his best-functioning foot is wasting resources." The intensive training of the weak foot loses out in everyday training, or is this different with you? For convenience, when I as a trainer of players emphasize the use of the weak foot, there is muttering, or the practicing is done for, because hardly anyone can do that. The trainer's self-confidence also isn't strengthened when an drill doesn't work. Basically, if each drill is started with the good foot, then the procedure only becomes poorer with the weak foot. But it's clear that this is no fun for the players. It is advisable to challenge only the poor foot, and then to master the moves with the good foot and in this way to gain self-confidence. However, the result is often something different: the drill is too difficult, since otherwise it would also work with the weak foot. Therefore, we have to find a way to challenge the poor foot better than by standard drills, most of which are designed for the stronger foot. When we have raised the capability of the poorer foot we can use it in any drill. And now comes the surprise: We do away with the soccer ball and try to handle other balls with feeling. This can be a football, or a tennis ball. Small balls are ideal since they don't have to be stroked and guided, otherwise they're gone. Whoever has played soccer with a football will know in hindsight that the game is considerably simpler with a normal soccer ball. So it is also with the weak foot, and it will then also be able to handle a soccer ball much better. It's not a matter of timing or tricks, but only of the sensitive handling of the various balls. The ball is guided and caressed with the entire surface of the foot, regardless of whether it is the sole, instep, inner instep, or outer instep. It is important again and again to pull the ball with the sole, from one side to the other and back again. There is a slight forward motion to do this, to pull the ball back and shift it diagonally with the inner and outer instep. You will see the feeling for the ball develop with playing. This also happens while sitting, in the living room, or at home on the computer. It's better to cover the motions during the execution. The procedure is intentionally overacted, since it is not a question of beauty or speed. It is time for this when we have automated the procedures.